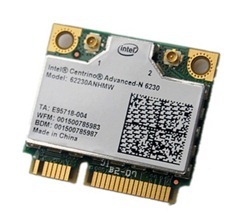 The Intel Centrino Advanced-N 6230 is a dual-band (2.4 GHz and 5.0 GHz), 2x2, IEEE 802.11a/b/g/n Wi-Fi plus Bluetooth wireless adapter that delivers up to 300 Mbps of bandwidth, up to 2x the range, and more consistent connectivity. This PCIe Half Mini Card provides a low profile design for existing laptops as well as for newer, thinner, smaller laptops, netbooks and tablets. The Intel Centrino Advanced-N 6230 also supports a host of Intel-only features, such as Intel Wireless Display, to enhance today's mobile lifestyle. Data-intensive consumer and business applications and rich media services (streaming HD video, gaming, data backup) which demand unparalleled wireless capabilities and highest reliability in crowded, heavy traffic and larger area wireless environments.